Hiyam Noir reports from the war zone in Gaza. We thank her and her colleague, photographer Fady Adwan, for risking their lives to report the truth from Gaza. 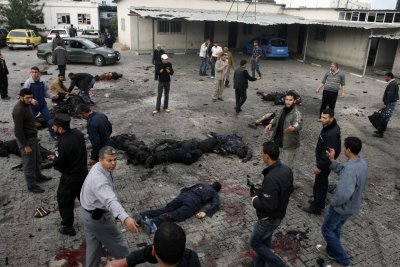 On Saturday noon in the first wave of air strikes, the Israelis targeted Gaza City government buildings. Casualties are confirmed and include the Commander of Gaza Police Force Tawfiq Jabir, the Commander of Security and Protection Services in Gaza police, Ismail Al-Ja’bari and the Governor of the Al-Wusta (central) Districts Ahmad Abu Aashur. Islam Shahwan, a Hamas police spokesman, said that the Israeli attacks have destroyed most of the Gaza Strip police headquarters and that a police graduation ceremony was being held during the Israeli assault. Following the first wave of Israeli air strikes, that killed at least 156 and injured over 200 Palestinians (Ed. note: updated numbers since Hiyam wrote this, reported in some western media: at least 200 dead and 300 injured – end note), Palestinian medical sources said in a press statement during Saturday afternoon that at least 80 of the wounded has arrived to hospital in “bits and parts” and the Head of the Gaza Emergency and ambulance department in the Ministry of Health, Mu’awieyah Hasaneen confirm that medical crews and rescue workers are still pulling dozens of people from underneath rubble. Hasaneen have pledged to all Arab governments, to send medications and operating supplies to Gaza, saying most of the injured were too badly injured to be moved outside the Gaza Strip. Hospital corridors are filled with bodies and gourneys, and in the local morgues there is no space to for all the bodies. Leaders and citizens of Arab countries condemned Israeli air strike on Saturday. A few minutes after the first 30 Israeli air strikes at noon on Saturday, an Egyptian official said that the Israeli missile attacks was “an unprecedented massacre.” Hosni Mubarak, the Egyptian president condemned the attacks, demanded that the ceasefire between the Palestinian resistance in Gaza and the Israeli army to be renewed. “Egypt will forge ahead with its contacts to create a favorable atmosphere in renewing the truce and attaining inter-Palestinian reconciliation in a bid to end the suffering of the Palestinian people”, a statement from the Mubarak’s office said. Fouad Seniora, the Lebanese prime minister called the Israeli operations “tragic and criminal”. A statement from the Seniora’s office “strongly denounces and rejects the criminal operation in the Gaza Strip.” The Lebanese prime minister called on the Arab League and other heads of state to immediately convene in an emergency session to adopt a “united Arab stand to face the Israeli aggression.” Seniora also called upon United Nations security council to adopt “deterring and necessary measures against Israel for its continuous violations of Palestinian and Arab human rights”. The Gaza operation plan was architectured on Wednesday. Ehud Barak and Ehud Olmert ordered the air strikes on Gaza, Saturday morning, the assaults on Gaza Strip are intended to last throughout Saturday and perhaps into Sunday. The two Zionist leaders asserted that Israel has prepared for an operation that could take several weeks. Preparations have also been taken to contain any expected response in the West Bank. Ehud Barak and his chief of staff, Gabi Ashkenazi, are supervising the air strikes, which they say – will “continue until the Israel has achieved its goals”. Israeli sources asserted that the operation does not aim to topple Hamas, but “we will stop homemade projectiles,” the statement said, warning for ” tougher images” in the Gaza Strip in the coming days. The Al-Quds Brigades ( Islamic Jihad) asserted that they are in high alert and that the Israelis will pay a severe toll for their heavy handed attacks. 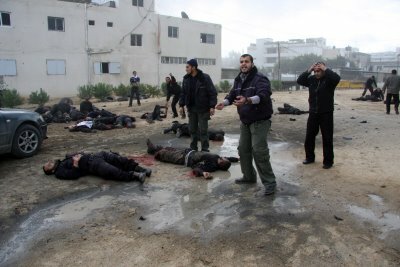 The Islamic Jihad leader, Khaled Al-Batsh, said that the Israeli attack is a declaration to “open war” against the Palestinian people, intended “to repress the Palestinian resistance.” Hamas spokesman Fawzi Barhoum asked the Palestinian people to “remain patient in the light of Israeli crimes ” – he called for a massive response to the Israelis air strikes that have killed at least 200 Gaza residents, and wounded over 200. Barhoum stated that there will be a renewal of Palestinian operations within Israel. Israel needs to stop these attacks. This is murder. What Israel is doing is a crime. Not everyone in the world agrees with what they are doing. There are many who believe they are committing criminal acts of genocide. These are crimes against humanity and war crimes. The United Nations should find a way to stop this. All aid to Israel should be stopped. They only use it to kill. There are a Number of Videos Here not for the faint of heart.